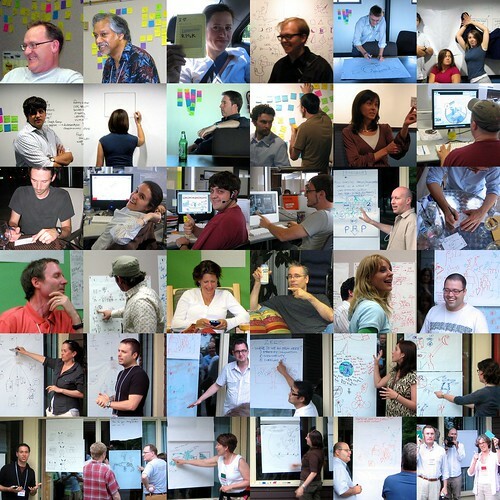 VizThink Community, originally uploaded by dgray_xplane. Tom Crawford of VizThink started a conversation by asking people to visualize the visual thinking community. There's an interesting thread of comments here and some images here. Some of the commenters said that it's a mistake to try to segment the community. I don't know if I agree but I do think it's difficult. In my opinion visual thinking is like a lens -- it can be applied to anything. So here's my attempt to picture the community -- it's a small sample of the visual thinkers I have met and connected with in recent months. Do you see yourself? I suppose that my comment written below, makes one synthesis of their contributive spirit! My sessions at VizThink: What do YOU think? What can visual thinking do for you?